When the UK government said it was thinking of ending its long-standing ban on astronauts, surely it wasn't thinking of putting teddies in space? But pictures have been released of two British toy bears in spacesuits with the curve of the Earth clearly visible behind them. 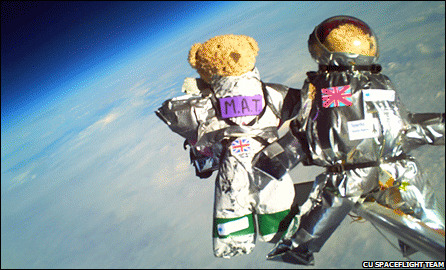 In fact, the teddies were lofted into the stratosphere by Cambridge school children as part of a science project. The "teddy-nauts" spent two hours in flight before landing near Ipswich. 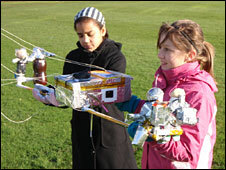 "The most important thing we think we can do is to try to encourage children to get involved in science and engineering, and the best way of doing that we thought would be with the kind of engineering project we would have loved to have done ourselves at their age," said Ed Moore from the student organisers, Cambridge University Spaceflight. Four teddies were prepared for the flight on a helium balloon by 11 and 12-year-old pupils from Parkside and Coleridge Community Colleges in Cambridge. The bears, dressed in their special suits, were launched from Churchill College on a foam-padded box containing instrumentation and cameras. 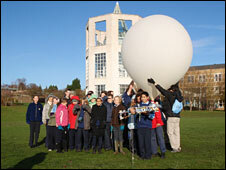 The balloon climbed to 30km. All four teddy-nauts came through the experience intact. The Spaceflight team followed the toys' progress across the sky via an onboard GPS system and picked them up just north of Ipswich. "The outside temperature got down to about -60C but some of the teddy bears were kept as warm as -35C thanks to their spacesuits. Apparently they're all in good health now," Mr Moore told the BBC. "I really enjoyed launching the teddy bear into space and I also enjoyed designing and building the teddy bear suit," said 12-year-old Kane Robbins. "The balloon was enormous compared to the normal balloons, and it was really hard to keep hold of, but it was great fun letting go of it." The Cambridge University Spaceflight team hope soon to put a rocket in space, launching it from a balloon that has already climbed high into the sky. The student group believes the rocket can reach an altitude of 150km. UK government policy since the mid-80s has been to sideline human spaceflight activity. Britain pays nothing into the astronaut programme of the European Space Agency. Those UK-born individuals who have flown in space recently - Michael Foale, Piers Sellers and Nicholas Patrick - took out US citizenship to enrol in Nasa's astronaut programme. This could all change. A number of reports recently have argued that the nation's strictly robots-only approach to space should be more flexible; and the government itself has agreed to review the situation. So what is the right stuff?